You can Apply or Update your Aadhar Card in Enrollment centre with ease and some people find it more reliable than online method. Now Thankfully you have two options when it comes to Enrolment and Update Centers. You have Normal Enrolment Centres and then you also have Banks & Post Offices serving as Centers. We will discuss both of the options so you can find the nearest centre and Apply/Update your Aadhar. Enrolment and Update Centres are specifically made for people like you to apply and update their information. You can search these Centres by three types which I will tell you in a minute. But first, let me tell you the initial process. 2. Click on Locate Enrolment & Update Centres and you will be redirected to a new page. 3. Click on Search by State. You can also search Aadhar centres by Pin Code and Search Box if you want to be more specific. 4. Select your State, District, Sub District and VTC(Village/ City/ Town) from the Drop Down Menu. 5. Tick mark Show Only Permanent Centers, Enter your Captcha Verification Code and click on Locate a Centre. Note – Only Permanent Centers ensure that the Address of Center you get is always available at that location. 6. Now you will see the names of Registrar and Agency with their Address (Center Summary) and Contact Person Name. 7. You can Visit the Center and Apply/Update your Adhaar Information. To make Enrolment & Update Centres more available to people in the different areas, many Banks & Post Offices provide the service of Aadhaar Centers. You can Use these Centres for Enrolment and Updatation related Services as they may be close to your Home. I think we must start, so without further ado, let’s get started. 1. Head over to UIDAI official Websites. 2. Click on Enrolment & Update Centres in banks & Post Offices which will redirect you to a new Page. 3. Select your State, District, Sub District and VTC(Village Town City) from the Drop Down Menu. Alternatively, You can search Aadhar centres by Pin Code and Search Box. 4. Tick mark Only Permanent Centers, Enter your Verification Code and click on Search Box. 5. Now you will see the names of Registrar and Agency with their Address (Center Summary) and Contact Person Name. 6. You can Visit the Center and Apply/Update your Adhaar Information. Do you want to search for Aadhar Enrolment and Update Centre by Pincode? While searching for Enrolment centres, we want to find the nearest which is nearest to our location. 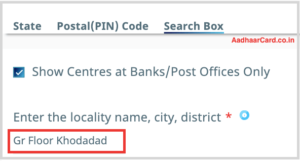 Searching your Aadhaar Center by Pincode make sure that you find the closest Centre. 1. On the Search Centre page, Click on Pin Code Option. 2. Enter your Pin Code and Tick Mark Only Permanent Centers to ensure that we get the most genuine results. 3. Enter Verification Code and Click Search. 6. You can Visit the Center and Apply/Update your Aadhaar Information. Do you want to search for Aadhar Enrolment and Update Centre by Search Box? While searching for Enrolment centres, we want to know the nearest Aadhar Centres. 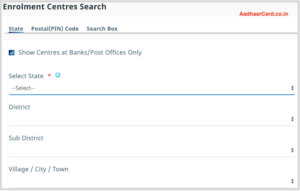 Well Searching your Aadhaar Center by Search Box is a way to wind the Enrolment Center in your Area. 1. On the Search Centre page, Click on Search Box Option. 2. In the Search Box Option Enter your Address as simple and Informative as Possible, don’t complicate things by writing too much. 3. Click on Only Permanent Centers, Enter Verification Code, and Click Search. 6. You can Visit the Centre and Update/Apply for your Aadhaar Card.